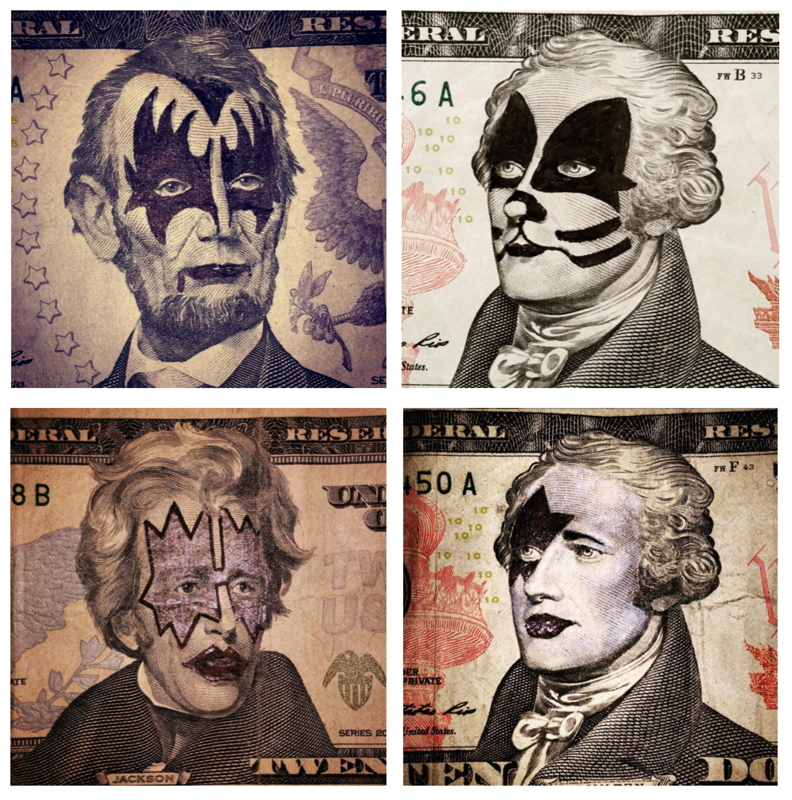 Roy Adams enjoys ‘refacing currency’ with homages to KISS and others. 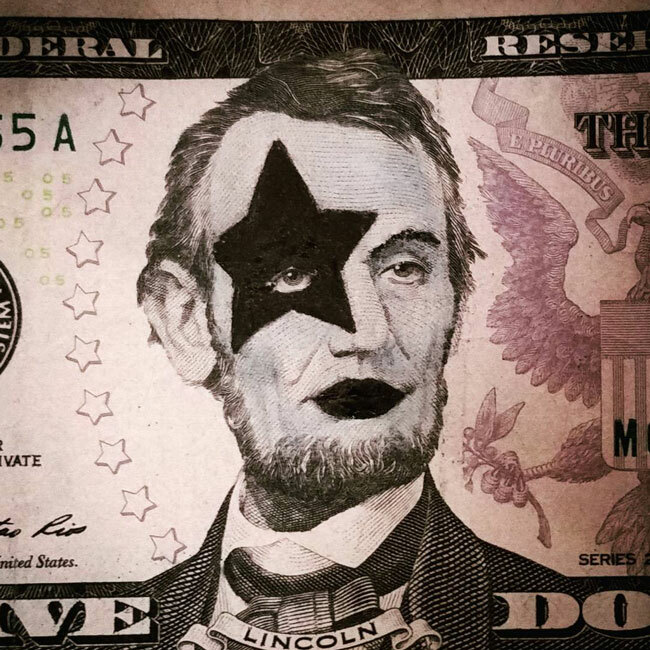 Jackson does not seem to be long for the $20 bill, but I don’t think Gene Simmons is on the short list. For the record, mutilation of national bank obligations can result in being “imprisoned not more than six months”. 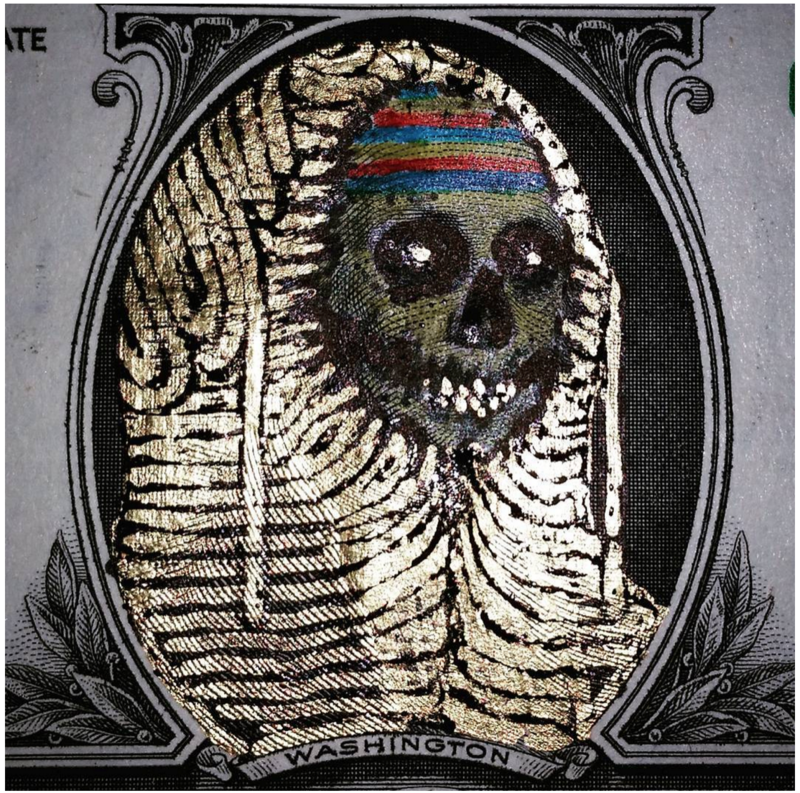 Explain your interest in currency as a canvas. I remember going through my mom’s magazines as a little kid and drawing beards, eye patches, moustaches, cigars, clown makeup, et cetera on every face I could find (full disclosure; I still do this). I think it was my way of redefining something deemed serious as humorous. 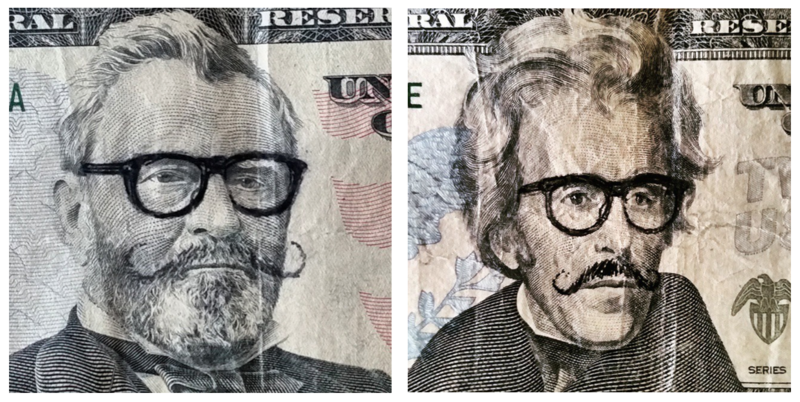 After I ‘reface’ the bills they always go right back into circulation with my usual shopping. I don’t think I’ve ever had anyone say a thing about it. 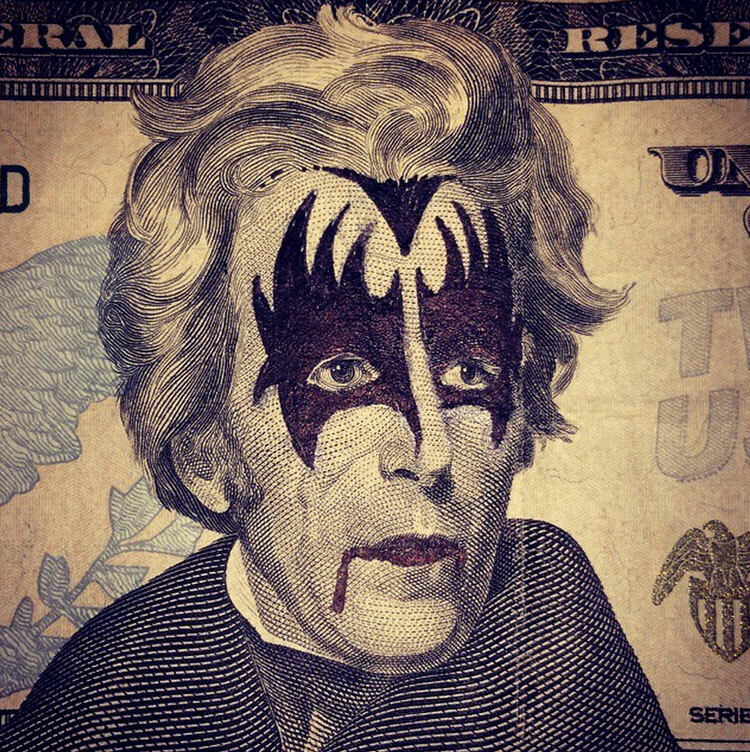 I guess money is still money even if it looks like Gene Simmons or a 3-eyed zombie. Tell us about your relationship to art. I currently live in St. George, Utah and I run a website called RepoFinder.com. Art has always been a part of my life. There are many talented artists on both sides of my family so creativity was always paramount in my childhood. I have vague toddler age memories of my mom giving me crayons and a stack of paper plates to draw funny faces on. I still remember the second grade bully pulling me aside and asking me to draw him a unicorn flying over a rainbow. That gesture earned me not only playground protection but also a realization that art had the ability to influence people. I’ve always been the quiet kid so producing art became a way to communicate my range of emotions too. I think God gave me artistic ability not only to communicate my deepest thoughts, but also to draw funny faces to keep my kids entertained in church. You recently got EnChroma sunglasses that allow you to ‘see color’ after a lifetime of colorblindness. Wow. It was incredible. I just remember walking outside and looking at a pine tree in amazement. I couldn’t look away. It was the richest, deepest green I had ever seen. It was very emotional to say the least. I saw strawberry blonde for the first time and it’s even better than I imagined. The best way to explain colorblindness is to imagine looking at a very faded pair of blue jeans. 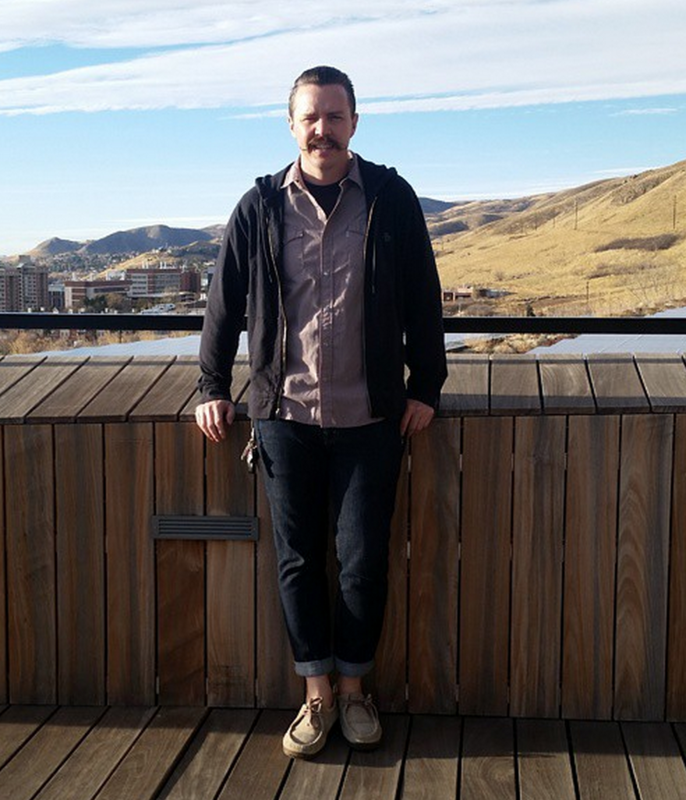 After you put on the EnChroma glasses those jeans become such a bright and vibrant blue that they seem to glow. They’ve become known as my magic glasses and I shamelessly wear them at night enough to make Corey Hart proud. Follow Roy Adams on Instagram.